During the 1490’s, European explorers encountered the Indigenous People. The explorers mistook these people for Indians and in many places on this website the Indigenous People are referred to as Indian because that was the language of the time. However, today it is important to recognize the names, cultures, and traditions of the First Nations People. On a scenic knoll not far from Edmundston, New Brunswick on the road to St. Basile, there is a village very different from surrounding villages. It is the Indian reservation of the Madawaska Territory and the remnants of the ancient capital of the St. John River. It is the home of the valiant MALECITE, the most faithful ally Acadia ever had and most feared enemy of the New England pioneer. The early site of this village was exactly where the present city of Edmundston is located. It was then known as Madoueskak. The tribal council hall was just about where the “F.W. Woolworth” Store is today, and the Indian cemetery was located at equal distances between the present Catholic and Protestant churches. Tradition has it, that this Indian establishment existed several centuries before the French exploration of Acadia and Canada. At the time of the foundation of Madawaska by the Acadians, the Indian village numbered about three hundred inhabitants and was the most important center of the MALECITE tribe. The principal MALECITE villages on the St. John River were, Menagoneche (St. John), Aukupag (Springhill, a small village seven miles above Fredericton) and Medoctec, eight miles below Woodstock and Madoueskak at the mouth of the river of the same name. The MALECITES themselves were part of the ABENAKIS Nation and along with the PASSAMAQUODDYS, occupied the whole St. John Valley. The two tribes were formerly known as the ETCHEMINS. The ABENAKIS were part of the ALGONQUIN Nation, one of the more important Indian confederations of Canada. The confederation occupied almost all the Canadian territory, east of the Great Lakes. It extended across New England and Acadia. The MICMACS, who lived in Nova Scotia and Eastern New Brunswick, were also of theALGONQUIN Nation. The domain of the ABENAKIS, was the valleys of the St. John and the Kennebec rivers. The MICMACS are generally considered the original inhabitants of the St. John Valley. The ABENAKIS of Maine, who were much more numerous, invaded the territory and pushed the MICMACS into eastern New Brunswick and Nova Scotia. The word “Madawaska” itself, is of MICMAC origin. “Madoues” means porcupine and “kak”meaning place…thus, the land of the porcupine. The true aborigines of the valley, then, could very well be the MICMACS. 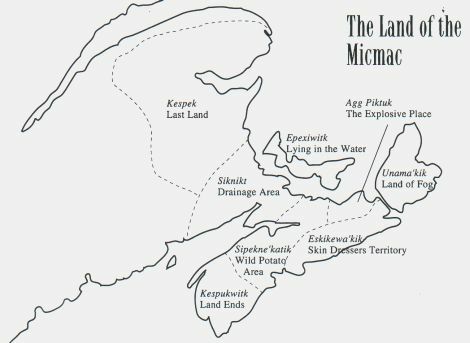 Mi’kmaq Territory consisted of all of Nova Scotia and Prince Edward Edward Island, New Brunswick (North of the Saint John River), the Gaspe of Quebec, and it is surmised by many that it included part of the State of Maine, as well as part of Newfoundland. The MALECITES were, then as now, a nomad people. They fished, hunted deer and moose, but most often they chased MOHAWKS, their foremost enemy. At certain times of the year, the MALECITE’s village was almost deserted. They often ate in leisure, what was gathered in a burst of feverish activity, at the price of great privation. Though barbaric in their way of life, they were typical Indians. Equal to Romans in their eloquence, their bravery and valor, they surpassed them in honesty of their morals. In fact, it was extremely rare that the Indians’ prisoner would be insulted. They might torture their prisoner, but never treat them indecently! The wife of the MALECITE, was his slave. She was forced to work much more than the men, who engaged only in hunting and war expeditions. She was extremely devoted to her children, whom she raised with great care. Of singular note: the women were more cruel than the men. They took part in the massacres of prisoners and in barbaric rejoicings that accompanied these scenes of cruelty. We have seen that the tribe of Madawaska occupied all of the St. John Valley from Grand Falls, New Brunswick (where I was born), to Sept-Isles (Quebec), including the valley of Lake Temiscouata. Their capital was, from time immemorial, situated at the mouth of the Madawaska River. This village was surrounded by a thick stockade of trees driven into the ground, forming an impenetrable wall. The Indians from the Lower St. John Valley as well as those of the Kennebec and the Penobscot, took refuge in this enclave, during times of enemy incursions. Even though they were far removed from the IROQUOIS, their consistent enemy, these latter on several occasions, engaged in bloody battle with the MALECITE. Indian tradition relates two such MOHAWK incursions, with MALECITE forts burned and large numbers of their population, massacred. The most noted of these war expeditions occurred when some two hundred MOHAWKS from Upper Canada, mounted a major attack on the MALECITE. The IROQUOIS reached the St. John Valley through the Etchemins and came on a small MALECITE village at the mouth of the Allagash, and destroyed it. When they arrived at the village of the Madoueskaks, they found that Pemmyhaouet, the great chief of the MALECITE, had organized the defense of his fort, with the help of about one hundred braves. The ensuing combat became one of the most memorable, recorded in Indian legend. The courageous Pemmyhaouet had died in combat, and his son was also fatally wounded. As the defendants fell under arrows and tomahawks of the assailants, their wives and young girls replaced them. It was only after several days, when the besieged MALECITES ran out of arrows and spears, that they gave up the struggle. The fierce MOHAWKS found, in a corner of the ruined fort, two women who begged for their deliverance, by death. They were Necomah, the wife of the fallen chief, and Malobiannah, his son’s fiancee. The chief’s son, had just died and the two women had braved the furor of the MOHAWKS, to bury their loved ones. Encouraged by their success, the IROQUOIS warriors resolved to continue their quest to the Lower St. John Valley. Since they did not know the territory, they took the two women captives, to guide them down the river. At nightfall, the bark canoes were tied together and left in the care of Malobiannah. Necomah, the chief’s wife, had already died of sorrow. Malobiannah mourned her fallen fiancee, and wept over the calamities that had befallen her nation. But in her heart, she kept the Indian emotion of revenge. She resolved to sacrifice her own life, to avenge her loved ones and at the same time, save her brothers of Aukapug and Medoctec, from the disaster awaiting them. She would lead the flotilla over the falls at what is now known as Grand Falls…my home town! At some distance from the chasm, the warriors who had fallen asleep, were awakened by the noise of the falls. They asked their guide what made such thunderous noise. She answered calmly, “it is a new river, the Walloostoock”. All the while, the fleet was being drawn towards the abyss. The MOHAWKS, reassured by the composure of the young MALECITE girl, went back to sleep. They were only a few hundred feet from the falls, when they felt themselves caught in the treacherous current and realized their danger. They jumped from their canoes, but it was too late. Shouting curses, they disappeared in the foaming cataracts, accompanied by the triumphant shouts of the heroic daughter of the people they had vanquished. The last thing they heard, were the names of her fiancee and the praises of her avenged nation. The MALECITE heroine, has long been sung in the languages of the ABENAKIS, the French and the English. What a rich theme for a future novelist of Madawaska! Greek history, so rich in deeds of chivalry of all kinds, does not offer anything greater, nor sublime, than this simple unknown sacrifice of this obscure daughter of the forest. In spite of their bravery, the MALECITE were once again defeated. The villages of the lower valley, were once more threatened. It was then that all Indians of the MALECITE tribe who could carry arms, from the St. Lawrence River to the Bay of Fundy, went to Aukupag, where they expected the battle to take place. The fray was bloody, but this time the MALECITE and their allies, held the upper hand. The defeated MOHAWKS, retreated back to their forests. The Indians of Madawaska attributed their many defeats to the evil spirit. According to one of their legends, an enormous beaver, a monster of colossal proportion possessed by an evil spirit – none other than Glouscap – had predicted numerous misfortunes. Outraged by the Malecites’ infidelities, Glouscap, after having ravaged the lower valley, had come back to Madawaska announcing to the inhabitants, that their fort would be destroyed and the MALECITE would see many long moons of misfortune. Seized with terror, the Indians of Fort Madoueskak, tried to appease the vengeful spirit. They gathered the best beaver skins and placed them at the mouth of the river. A seer who lived on the banks of the river, came to tell them that Glouscap had looked with favor on their offering and the MALECITE would see happier days. Very pleased with the sacrifice, the spirit wanted to show his satisfaction. Seeing that a small stream flowed at the far edge of their encampment, he changed its course, to make it flow nearer to their dwelling. However, a huge cliff formed a fall in the bed of the new waterway, so, with one sweep of its mighty tail, he brushed away part of the rock, to permit canoes to pass through. He then went back up the river, to spend the winter in Lake Temiscouata. The following spring he returned to the land of the setting sun from whence, according to legend, he shall return to punish any MALECITE who does not remain faithful to the Great Spirit, who dwells in the land of the rising sun. These legends are carefully preserved by the Indians of the Edmundston reservation. They are displeased when their audience shows disbelief and are angry with those who might laugh at a legend relating to the Indians’ ancestors. The discovery of axes and stone spears in Edmundston in 1925 or so, confirms the presence of Indians in the region, in a far distant past. According to archaeologists, these primitive weapons date back to three or four hundred years before the era of discovery of the territory. However, the first recorded data that we have on the Indians of Madawaska, are the notes of Bishop Saint-Vallier, second Bishop of Quebec. These notes were made during his visit to Acadia in 1686, one hundred years before the first settlement in the valley. The following is from “The State of the Church and the French Colony in New France” (L’État de l’Église et de la colonie française dans la Nouvelle-France), published in Quebec, in 1856. “On the second day of our journey on the St. John River, on May 16, 1686, we saw a hut belonging to Christian Indians of Siller, who in order to go hunting, had stationed themselves at the mouth of the river that they call Madoueskak and that we renamed St. Francis de Sales.” (Note: On D’Anville’s map, the Madawaska River is called the Great St. Francis, while the present St. Francis River is called the Little St. Francis). These Indians had known civilization. There seems to be no doubt the “Black Robes” (Priests) had spent some time in Fort Madoueskak, before the expedition of Bishop Saint-Vallier. We believe the first English publication to mention Madawaska, is a leaflet entitled”Memoires of Odd Adventures in the Captivity of John Gyles” published in Boston in 1735. In his interesting narrative, Gyles tells of having seen several huts at the mouth of the tributaries of the St. John River. In 1692, a French explorer, Lamothe Cadillac, founder of the city of Detroit, navigated up the St. John River. He reports that “at forty leagues above Fort Medoctec, there is another fort to which natives retreat, when they fear some calamity”. William de Rosier’s map of the Abenakis missions of the St. John Valley (1699), indicates that at the same time there were nine Indian settlements in the area; three on the Aroostook River, four on the St. John River, one on Eagle Lake and one on the Squateck Lake. One St. John Settlement was at the mouth of the St. Francis River (Madawaska). A later map of the Madawaska Valley, dated 1787, by George Sproule, Surveyor-General of New Brunswick, informs us that there was, at the time, on the southeast bank of the Madawaska River, an Indian village of about sixty families, which was the capital of the MALECITES. Sproule reports: “It is here that the Great Council Hall is located. These Indians are visited by priests from Canada”. For a long time after Bishop Saint-Vallier’s visit, the Indians remained sole masters of the Upper St. John Valley. But if the Canadians and the Acadians did not contest their exclusive right to the land they did, on occasion, question the Indians’ exclusive claim to hunt and fish, in the area. This displeased the Indians. For example, in 1764 two chiefs of the St. John River, Pierre Tomah and Ambroise St-Aubin, complained to the authorities in Quebec, that the Canadians of Kamouraska (the county were my in-laws were born) were taking their beavers away. Their petition stresses; “From time immemorial, beaver hunting has been forbidden to the French from Grand Falls(New Brunswick)…my home town, to Lake Temiscouta (Quebec). This hunt has been reserved for the Indians”. Their complaint was deemed legitimate, because the government issued an ordinance forbidding Canadians from hunting in the territory (Quebec Gazette, January 24, 1765).Later, the Indians carried the same complaint to the governors of Halifax. During the American Revolution, in 1776, three hundred MALECITES who sympathized with the rebels, went to Aukupag to meet Colonel John Allen of Machias, Maine to discuss an offensive alliance against England. Among the delegates from Madawaska, were the chief, Francois-Xavier, his Lieutenant Grand-Pierre, Pierre-Michelle Shawigenet and Arganouet Washington. The latter had taken-on the name of the American General, to show his sympathy for the revolutionaries. By his tempestuous harangues and perhaps more so with his gifts, Colonel Allen persuaded most of the Indians of the St. John Valley, to renounce their British alliance and join the Confederates. After this conference, the Indians sent a declaration of war to Major Studholme, commander of Fort Howe, St. John, New Brunswick. The situation was becoming thorny for the English of the St. John Valley. The defection of the Indians, could complicate the war considerably and bring about disaster. In an effort to urge them to be faithful to the British crown, a convocation of all Indians of the province, MALECITES included, was called at St. John. It was presided jointly by Major Studholme and Father Joseph-Mathurin Bourg. Father Bourg, the first Acadian priest, resided at St. Joseph of Carleton, Baie des Chaleurs. He was the only Catholic missionary tolerated by the governors of Halifax, north of the Bay of Fundy. At the meeting, the missionary had to surmount many obstacles. Fortunately, his devotedness and loyalty were well-known to the English, as well as to the Indians and it was only after much negotiation with chief Pierre Tomah, that the priest was allowed to be heard. In the middle of a tempestuous session when any understanding seemed impossible, the chief suddenly withdrew to the banks of the river, to meditate. There, prostrate on the ground, he prayed for an hour. With an enigmatic air, he came back to the council, carrying the message of the Great Spirit; “Peace with the English and with the revolutionaries”. The MALECITE of the Madawaska River however, remained on the alert throughout the Revolutionary War. They had little or no attachment to the British crown, and they often expressed in typical Indian fashion, on insignificant events, all the contempt they held for the governor of Halifax and later, that of Fredericton. “Twenty-six springs ago (since the takeover of Fort St. John by Moncton, in 1758) we have followed your ways. During that time, we have our village clean. But now a young man, a bad MALECITE, has thrown a bloody branch into it. We have handed him over to your authority, so that the great chief of the English, may do with him as he judges appropriate”. “I do not believe he is guilty. In my capacity as chief, I promise to bring him back if you should find some proof of his guilt”. “The pale faces, of whom you are the chief, are responsible for this crime. In the future, see to it that no one brings fire water into my territory; it is the cause of all our misfortunes”. Harguenion was freed and relations between the Indians and the authorities of Quebec improved. Noiste was convicted and executed in Quebec. Father Bourg was a great influence in seeing that the Indians obeyed the laws. He had even thought of establishing schools in the tribe, “where the dispersed Indians could meet; where good teachers could teach the young people to read and write, and thus form happy citizens useful to society”. But the project never materialized. The letter that you wrote to me on the 28th of last month, was given to me yesterday, by the MALECITES. Like you, I am convinced of the good that could be done in the present circumstances, if a missionary could take up residence with the Indians. I have, therefore, addressed myself on this subject, to the Vicar-General. His answer prompts me to beg you to spend all your energy in keeping them happy and maintaining them, in the right way. In the matter of the recent murder of one of their loyalists, they must not doubt that justice will be done, if they carry their complaint to the Governor of New Brunswick. In the meantime, I hope your efforts will succeed in preventing them from perpetrating violence, upon the messengers and travelers. Father Leclerc, who knew thoroughly the MALECITE character, did not have any trouble keeping them within the law. They even begged the Governor to allow the zealous missionary, to take up residence among them. “At the request of His Excellency, I have the honor to write to you to inform you that the Indians of the St. John River, have expressed the desire to settle in a convenient place, provided that they have the direction of a Pastor. And since they requested that we ask you, before all others, His Excellency has promised them that, if you would take the responsibility of instructing them, you would be paid in a suitable manner by the Evangelical Society whose aim is the civilization of the Indians of this province. If you accept this proposition, you will do me the honor of writing to me to inform His Excellency and the Society of your conditions, to give these poor people the attention they desire”. Bishop Hubert informed of the desire of the governors, asked Father Leclerc to give all his attentions to the MALECITES and to cooperate with the authorities of New Brunswick, who were becoming more tolerant of the Catholics. Perhaps no missionary of the time, has had more influence on the Indians, than Father Ciquart. He was a Sulpician, exiled from France by the revolution. Before coming to the Madoueskak, he had spent many years in the missions of the Kennebec. Speaking of the MALECITES, he wrote to his Bishop: “They are literally little children, but well-behaved. I think, in the future, they will be obedient and submissive. They have well-behaved in the short time that I have been their Father. They love me and I am attached to them. I will not leave them without shedding many tears”. One day Father Ciquart received presents from the governor to distribute to the Indians of Madawaska. To these, he added an illustrated book of missions which he gave to the new chief, Grand-Pierre. Wanting to know what impression the book had made, the priest questioned the chief. At first there was no answer. The chief kept looking at the pictures, with dreamy expression. Then his expression turned to one of sorrow. “Great Father”, he said, “this reminds me of an old saying: When you give something to a Mohawk, he has a lot of tongue but no heart. Today, in receiving this beautiful book, Grand-Pierre has a lot of heart, but no tongue”! Grand-Pierre presided over the Madawaska village for a long time. But toward the end of his life, his subjects abandoned him. Disappointed by so much ingratitude, he was unable to bear such abandonment. He renounced his jurisdiction and ended his days with the first Acadian colonists, where he remained greatly respected until his death. His grave is three or four acres from the St. John River, about a mile below the church of St. Basile. This field, is still known as the “flat of Grand-Pierre”. Grand-Pierre’s successor, was Louis Shaougenet known also as, Bernard. He was the grandfather of John-Shawiche Bernard, who died in 1918, at the age of 90. When Bishop Denault came for the first Confirmation in Madawaska in 1803, fifty-eight Indians received the Sacrament. From that date, the population of the village diminished rapidly. In 1812, Bishop Plessis found only two huts at the mouth of the Madawaska River. At certain times of the year, the wigwams were completely deserted. For example in 1826, a year of great famine for them, they spent the winter encamped at the door of the church of St. Basile, where charitable colonists fed them. The following winter, they went down to St. John, 260 miles from their village. According to statistics, their population was two in 1834 and two in 1840. In 1850, it had gone up to thirty, and fallen to seventeen in 1860. In the 1920’s, the reservation numbered about fifty souls. This variation in population figures, is explained by their nomadic way of life. The procession of the Blessed Sacrament, has always had a particular attraction for them. The Holy Parade, as they called it, never failed to draw all the inhabitants of the village, to St. Basile. They came decorated with brilliant stars of various colors, armed with spurs and muskets, as for a military parade. The Elevation was greeted with a volley of gunfire, then they entoned the “O Salutaris Hostia”, in their own language. The rest of the day was given over to patriotic rejoicings, where Bacchus was too often the “saint” of the afternoon and the object of the wrath of the pastor of St. Basile. Father Bourg’s dream of the 1800’s, has finally been realized. The Indians have their own school, paid for by the government of Ottawa! The descendants of the MALECITE does not take readily to cultivating the soil. He has a nostalgia for the forests and does not shine in the sun of civilization. His family decreases, even though his morals are honest and his physical and mental qualities, are not inferior to those of the races that surround him. Strange anomaly: he despises agriculture “the lowly art of peace”. He dares not add “The lowly art of the conqueror”. The hand that has brandished the tomahawk, is not made to guide the plow. The hand that has pulled-off the scalp of the MOHAWK, does not stoop to pull vegetables”. Those words of the great-grandson of Grand-Pierre, depicts the wounded pride of the ancient warrior race. Cincinnatus in reverse, the MALECITE despises the fields that the great Roman loved to cultivate, between battles. His impatience with things of peace and, fundamentally, his hatred of the white race, will always leave him hostile to a civilization that has dispossessed him; a civilization that has erected a wall between the two races, from where mourns the wounded ego of vanquished ancestors. Like Achilles, he withdraws into the shadows of the last oaks of the forest primeval, and with a haughty air, awaits the death of the race! Re-print from “The History of Madawaska” with copyright permission from the Madawaska Historical Society.